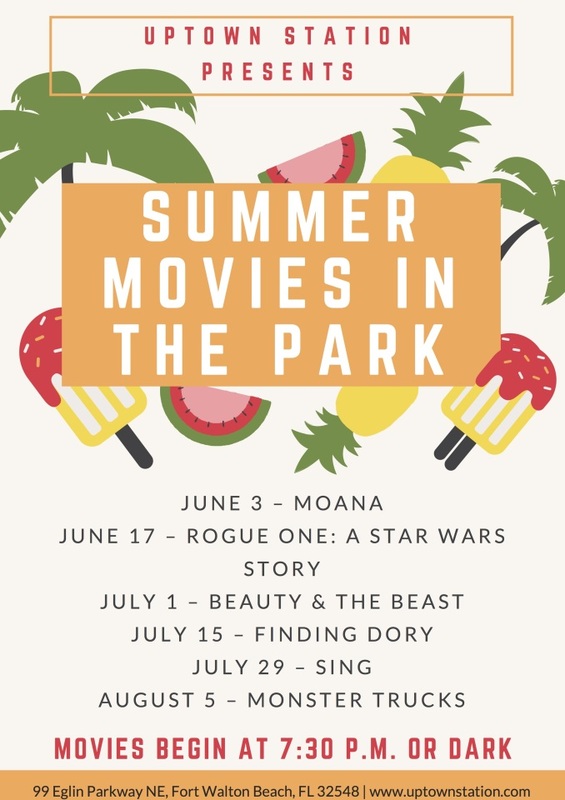 Beginning Saturday, June 3, 2017, Uptown Station in Fort Walton Beach, Florida, will begin their six-week Movies in the Park Summer Series. The community is invited to re-live the old time drive-in movie experience at Uptown Station’s Central Park. Movies will take place every other Saturday in June and July, and the first Saturday in August. Movies begin tentatively at 7:30 p.m. or dark, whichever occurs first. The schedule includes Disney classics such as Finding Dory and new releases like Rogue One: A Star Wars Story. All attendees are encouraged to bring blankets and chairs for seating. Movies in the Park are complimentary to attend. This entry was posted on Friday, May 26th, 2017, 9:00 am and is filed under Movie Nights, Upcoming Events, Uptown Station News. You can follow any responses to this entry through RSS 2.0. Both comments and pings are currently closed.